Fun plush toy with 2 squeakers! 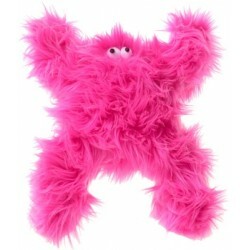 This popular & fun dog toy has lush fur and long floppy arms .. Your pup will love getting one of these plush, cute, and fun squeaker toys. They will love how styli.. This Bat Dog Toy is sure to scare up some fun for your precious pup this Halloween. This dog toy is ..
Who wouldn't love a stuffed dog toy named Boogey? This handcrafted Boogey won't be hiding..
Every Pampered Pup should have one! The handbag every woman wants is now the toy every dog should.. Your little one can have his own fun with this adorable plush squeaker dog toy. His friends wi.. The unique design of this fun and plush dog toy will have everyone smiling. Our dogs need to h..
SOFT PLUSH LAMB! Shari Lewis' beloved lamb is now a classic lovable soft plush dog .. This soft toy is filled with crinkle paper and provides hours of entertainment! Soft plush ducky ..
What a sweet toy to please your special puppy! And it's Made in the USA! Will your lucky pupp..
Patriotic Heart Shaped Plush Dog Toy! Americana toy with a squeaker inside and 5"! .. Your special pup wants to celebrate summer, too. What a great way to celebrate with stars and stripe..